HACAN are continuing their quest to use European Community law to have night flights banned in the UK. They have denied claims that the EU does have authority in this area citing articles in the Treaty which established the Community which relate to transport. The treaty gives the Council authority, acting by qualified majority, to law down common rules applicable to international transport. A spokesperson for the group said, "Transport is an EU issue, the Single Market is an EU issue, and competition policy is an EU issue. It is simply not possible to do this on a national level for obvious reasons. We are calling for action on the basis of noise. Noise is an EU issue." The European Parliament and Council adopted a Directive in 2002 whose main aim is to provide a common basis for tackling the noise problem across the EU. Five MEPs from across Europe (including Dr Caroline Lucas, the Green MEP for Southeast England), are sponsoring a Written Declaration to be presented to the European Parliament in April calling for a ban on night flights at all European airports between 11pm and 7am. If the Written Declaration can get 318 MEPs from across Europe to sign it, a ban on night flights effectively becomes the policy of the European Parliament. HACAN also deny that it is not possible for flights to depart and arrive during day because of time zones as some have suggested. They say that time zones are unlikely to present insuperable problems. They considered several examples of long-haul flight routes and say that in each case it would be possible to work out a time for which the flight could take off and land during daylight hours - even for flights from the West Coast of America and the Far East. A spokesperson for HACAN said, "You may not be able to get the businessman to a 9am meeting every time but it certainly looks possible to rota most flights outside the night period in both directions. The main issues for airlines appears not to be different time zones but the threat of competition (who gets in earliest) and cost." They also dispute that night flights are necessary because of lack of capacity. They say most airports in Europe have excess daytime capacity even if it is not peak capacity. Some, such as East Midlands in the UK, have substantial daytime capacity. Where airports are full, the city is often served by other airports eg. 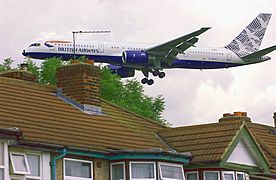 Heathrow is regarded as near capacity, but London has several other airports with available daytime capacity. HACAN are also dismissive of the argument that Night Flights are commercially necessary. They say charter and low cost often utilise night periods so they can achieve three or four rotations a day. With less utilisation avoiding night flights, say 2/3 turnarounds a day, capital costs of aircraft purchase/hire would need to be recouped over fewer operations, increasing operating costs. Depreciation/amortisation of capital assets is generally less than 10% of total costs, so this would mean an increase in fares of no more than 5%. HACAN say no firm evidence has been produced to show that night flights are essential to the health of the national economy.